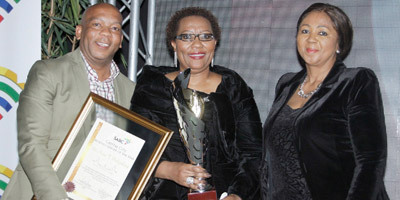 Dr Anna Mokgokong, Chairperson, Community Investment Holdings has been awarded the SABC Capital City Business Leader of the Year Award for 2014. The award conferred by the national broadcaster SABC & the Capital City Business Chamber honoured Dr Mokgokong for her contribution towards the economic growth of the capital city and her spirit and determination to the upliftment of the community with a desire of empowering them. Dr Mokgokong accepted the award at a dinner held on Wednesday in Pretoria attended by Mr David Makhura, Premier of Gauteng and Mr Kgosientso Ramokgopa, Executive Mayor, Tshwane Metropolitan Municipality amongst other dignitaries. The awards evening brought together some of the city's key business leaders to honour the capital city's most inspirational leaders. The SABC Capital City Business Leader Awards recognise entrepreneurs who demonstrate extraordinary success in the areas of business, personal commitment to the city and the communities. In addition to being the Chairperson of CIH, Dr Mokgokong is a leader in the community and has received numerous international awards for her entrepreneurial ability. She was the President of the South African women Entrepreneurs Network (SAwEN), and the International women's Forum of South Africa (IwFSA). She joined the Women Leadership Board of the Harvard JF Kennedy Business School in Boston in 2002. She has also been honoured by Star Group of the United States as one of the 50 Leading Woman Entrepreneurs of the World in 1998 and 2002. Dr Mokgokong was South Africa's Business Woman of the Year in 1999. In 2010, she was invited by former US president Bill Clinton to become a member of the Clinton Global Initiative. In her acceptance speech, Dr Mokgokong said, "I thank the SABC and jury members for this honour. It's a humbling moment and I accept this award on the behalf of the city with gratitude and responsibility. The city's influence on business is unparalleled and it is worth noting that the history of black entrepreneurship is rooted here." Dr Mokgokong's story is as inspiring as they come. An entrepreneur at heart, Dr Mokgokong sold sandwiches for pocket money while in school. Later, as a medical student, she went on to start a retail business selling leather handbags, the proceeds from which provided a springboard for wider business interests. Today her business span sectors like healthcare, technology, logistics, mining and energy. "Unless businesses integrate with the communities and provide young entrepreneurs the scale and scope to succeed, their opinions remain no more than wishes", said Dr Mokgokong. "With more than 50,000 small and big businesses owned by black entrepreneurs, the metro already contributes close to 8.5% to the GDP of South Africa. Big business need to come forward and be counted so entrepreneurs can contribute more fully to the city's economy." "Pretoria's reputation on the national stage is one we should all take pride in." "It is also heartening to see the city apply itself and I am pleased to say Mr David Makhura, Premier of Gauteng and Mr Kgosientso Ramokgopa are both sensitive to the needs of the community. This city cannot fail its resident entrepreneurs." "We need to move away from the idea of relying on the government and the private sector to provide employment for our young people; instead, entrepreneurship and self-employment are the more attractive options - a lead South Africa should follow."